Let me be the first to tell you how stunning this is–and yes, it works! Thanks so much for sharing your artistry so generously! Lovely – a tribute from one artist to another with a thread (several threads) connecting them across millennia. 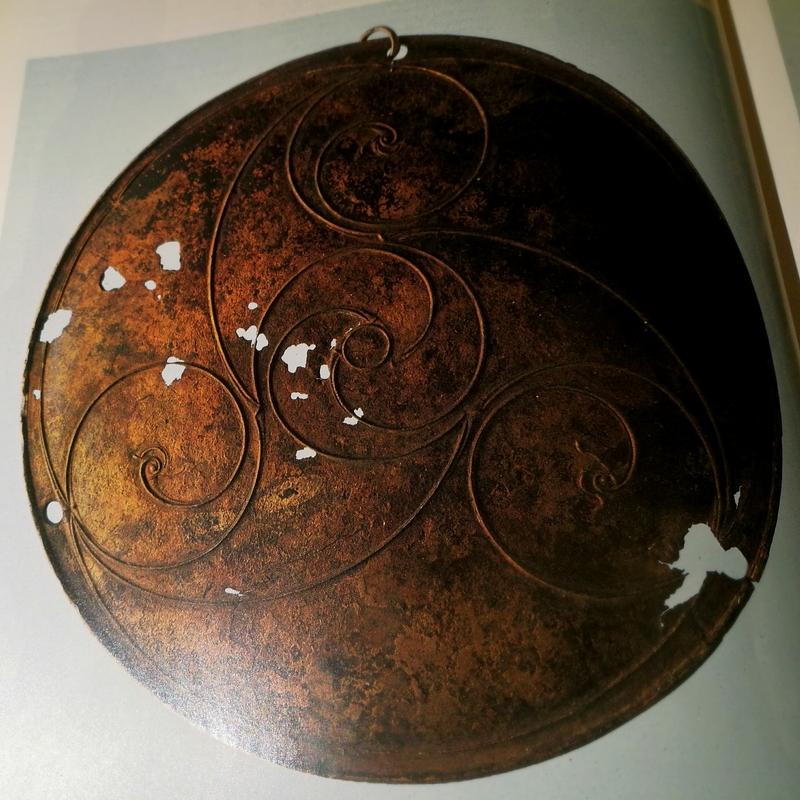 How about displaying it in a circular metal frame (or frame treated with bronze-coloured metallic paint) to tie it in with the original material? Or within a frame decorated with bits of mirror or coloured glass to represent the water that it’s been buried in for all these years? Don’t you find yourself wondering about the hands that made all these things, I get the same thrill from looking at all sorts of ancient art, so far away but at the same time so close. I like the bronze colour idea, I can see that working. Thank you. This is absolutely beautiful Anny. I think you’ve captured the spirit of the Celtic original. I hope you’re going to frame it and hang it on a wall somewhere. It certainly deserves that at least. Oh so kind Alan, thank you. I do intend to finish this one properly – I have so many that aren’t mounted, but this one I’m determined to see completed with a frame of some sort. I agree with your thoughts about _not_ displaying it behind glass — I think that’d obscure the glint & shine of the metallic threads. I like hb’s idea of displaying it in something round. It’s wonderful to see this complete beauty after following your process. Round metal frame would be great but this would hurt your composition, so maybe just rectangular metal frame? And no glass, that’s for sure! Definitely without glass. You want to give the shimmery bits the best chance to do so! It is beautiful and I can imagine it will look even more impressive when seen in situ. Really like the colour palette you haven chosen for this. An unframed hanging would be my suggestion for showing off this piece. Hi Anny – Stunning piece – such a beautiful vivid blue, I would love to see it in real life. I would agree – mount on canvas and without glass. A beautiful piece of work – I agree with no glass, it should be allowed to age gracefully and take on its own ‘patina’ over tome, like the real thing. Hi Theresa, many thanks for your comment, yes I’m glad the response is pretty much in favour of no-glass, I’m going to see if I can find a good way to mount it – I like those floating frames, I’ll have to find out more. Gorgeous, Anny! As everyone else, I agree that glass isn’t necessary and in fact would detract from the piece. One of the lovely aspects of your work is that it is so tactile; glass would be a barrier to that. The colours are so rich and wonderful, as are the swirling shapes, and really connect with the celtic tradition. Oooh. now you’re asking! What I really need is a pet framer (as opposed to a pet-framer which would just be unthinkable…) – someone who has a proper feel for textiles. I don’t know where to find one – any ideas?